Christmas Beers Bring Christmas Cheer | Drink. Blog. Repeat. What would the holidays be without alcohol? Copious and copious amounts of alcohol in all forms to help you get through the insanity of family, shopping, holiday parties and the like. 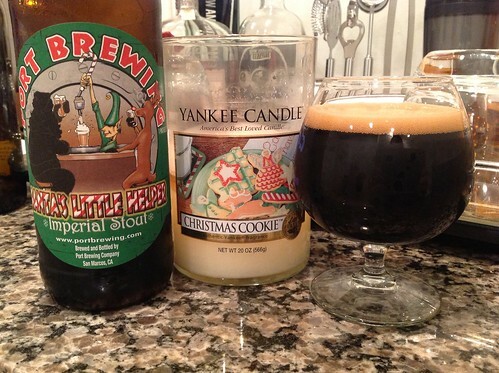 Fortunately, there are plenty of holiday appropriate beers to help you get through it all. Here’s what I enjoyed during this week. After having our own mini Christmas at our new home, my wife and I drove back to my parent’s house in Georgia to celebrate Christmas with them. I have the good fortune of having an easy-going, non-dysfunctional family, so I don’t need a lot of alcohol to help me cope. But that didn’t stop me from bringing along a bottle of St. Bernardus’ Christmas Ale to enjoy and share with loved ones. At 10%, the spiced Belgian strong dark ale does plenty to keep you warm and toasty. A malty nose brings hints of cocoa, plums, caramel, black pepper, cloves and that classic Belgian yeastiness. A similarly complex taste follows, with a strong effervescent quality leading off flavors of berries, plums, cocoa powder, leather, tobacco, sweet bread, cinnamon and other spices. 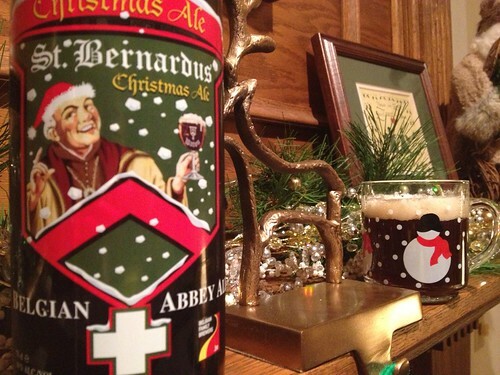 St. Bernardus always impresses me, but it also impressed my younger brother – a newly 21-year-old frat boy – and my dad, whose tastes lean toward “dark, heavy stuff.” It was a good way to warm up on Christmas Eve. After returning home to Columbia on Christmas Day, my wife and I tucked in to some holiday selections from my cellar. 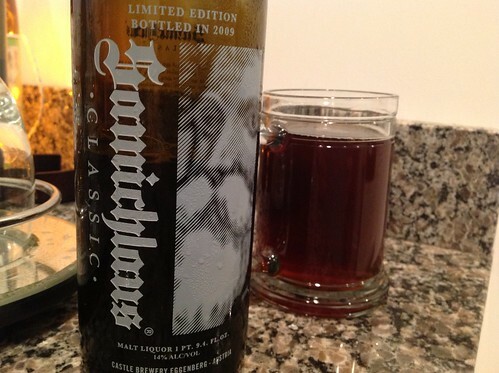 We started with a 2009 bottle of Samichlaus Classic, a 14% doppelbock from Austria that previously held the title of strongest beer in the world. At 14%, there’s just a slight hint of booziness on the nose, accompanied by a big, sweet malt character, hints of rum-soaked raisins, caramel, figs and a bit of maple syrup and just a slight alcohol burn on the back. The alcohol certainly hits you more on the taste, but it fades quickly into this sweet, rich, full-bodied blend of caramel, toffee, butterscotch, figs and a big malty sweetness with an almost hard candy quality. The sweetness is definitely cut well by the alcohol, which you can feel warming in your chest after a few sips. As we settled in for the annual Doctor Who Christmas special, I popped a bottle of the 2011 Santa’s Little Helper imperial stout from Port. Last Christmas, I enjoyed the bourbon barrel-aged version but help on to the standard version for this year. The coal-black 10% imperial stout presented with aromas of bittersweet chocolate, a touch of booze and a little bit of licorice, all underneath a cozy cover of big roasted coffee and espresso. Those roasted malts impart a big bitterness on the front of the tongue followed with a bitter coffee finish. There was a ton of espresso, dark chocolate, roasted malts and cocoa on it, but it’s not overly chocolatey or sweet at all. There may have been a slight infection in my bottle as there was this strange almost cough syrup quality on the finish. There was a phenolic burn on the back, kind of like the sweeter alcohol finish from NyQuil. It didn’t turn me off at all, and it honestly kind of worked with the bitterness. The third of four Christmases this year was spent at my mother-in-law’s house on Wednesday. With all due respect to my in-laws, they are a bit more … eccentric than my family, and two little ones running around only add to the insanity. That’s why I was happy to walk in to the middle of a holiday beer tasting orchestrated by my sister-in-law, which included the St. Bernardus Christmas Ale, Rogue‘s Santa’s Private Reserve Ale, Grand Teton‘s Coming Home Ale 2012 and, for dessert, some Lagunitas Cappuccino Stout. I also got sent home with bottles of each, as well as a Rogue Farms Single Malt Ale and a Westbrook Dark Helmet. Add that to the two six-packs of SweetWater Festive Ale my brother got me and the SweetWater IPA and Terrapin Liquid Bliss “reinbeers” from my mom, and this was quite a holiday helping. Whatever you celebrated this season, and whatever you’ll celebrate in the weeks to come, may your world be filled with delicious brews and good times. Cheers to all, and to all a good night. I wish my family was kind enough to supply such great offerings.